Tue., June 26, 2018, 6 a.m.
Alecia Christiansen applied to 10 hospitals after graduating from the University of Alaska with a nursing degree. Almost every one of them offered her a job, she said. Christiansen took a job at MultiCare Deaconess Hospital in Spokane and is among a generation of nurses with bright job propsects. They are needed in response to the aging baby boomer generation. Nursing schools, hopsitals and nursing homes are preparing for the growing nurse shortage while acknowledging the pressure to provide more care with fewer people. Meanwhile, nursing schools say they can’t graduate enough students because faculty, many of who are baby boomers, are retiring, too. And schools like Gonzaga University and Washington State University can’t find enough experienced faculty replacements because hospital jobs pay better. The schools’ struggle in hiring faculty has kept them from expanding to keep pace with job demands. At the same time, more and more prospective students are applying, making it harder to win acceptance as the application process becomes more competitive. At Deaconess, Linda Span, 66, works as the director of surgical units, but she’s also seen as a teacher and mentor to the 38 nurses in the ward, including Christiansen. Span said the hospital has a family feel that she’s proud of. It’s people like Span that nursing schools want to hire to teach. But she has no plans to retire. Like Span, experienced nurses in the baby boom generation will retire within the next ten years. But who will replace them? The biggest problem for hospitals is finding talent, and that’s where Spokane’s nursing schools are trying to step up. By 2030, Washington State will need an additional 12,000 nurses, according to the WSNA. Applications to nursing schools are on the rise. At WSU the number of applicants rose about 33 percent from 2014 to 2018, said spokeswoman Addy Hatch. “Here in Spokane, we accept just under 40 percent of fully qualified applications we get,” Hatch said. For three years, the WSU nursing school’s enrollment has held at just under 1,000 in all programs and all sites including Spokane, Yakima and the Tri Cities. Gonzaga’s nursing school also has seen a spike in applications. In 2011, Gonzaga received 420 applications for the nursing program, said Lin Murphy, interim dean at Gonzaga Nursing School. In 2017 the school received 780. And the acceptance rate is now 30 to 35 percent for nursing students, Murphy said. The bottom line: It’s hard to get into nursing school. Gonzaga and WSU officials said they want to increase enrollment. But they are held back by a lack of qualified faculty. “We’re limited in filling the demand for nurses on both the undergraduate and graduate levels, in all locations, by a shortage of faculty and a lack of clinical placements,” Hatch said. Gonzaga enrolls more students into its graduate nursing program. In fall 2015, 730 were enrolled, but that number dropped to 659 graduate nursing students in fall 2017. However, undergraduate nursing student enrollment is slightly up, she said. Tullamora Diede, 34, recently graduated from the WSU nursing doctoral program and was offered a tenure-track position. “I think it’s a good thing to have fresh ideas and be up to date on new policies and practices,” she said. Diede is also a supplemental nurse at Providence Sacred Heart Medical Center, and is able to apply that experience to the classes that she teaches. But still, she said she has mentors at WSU who she looks to for advice. “Other faculty who have been working three times as long and have much more experience,” she said. At Gonzaga, finding qualified nursing faculty is becoming harder, Murphy said. Staff and faculty are reaching out to professionals in the field, Murphy said. But a professor’s salaries aren’t as enticing as a nurse’s. A nurse practitioner’s average salary is $97,000, compared to a salary for a nursing school assistant professor’s $78,575, according to the American Association of Nurse Practitioners. Gonzaga doesn’t have any concrete plans to expand its undergrad program, Murphy said, but there’s room to expand the graduate program because most of it is held online. Just as long at the school can find qualified instructors. Washington State University also is holding its enrollment steady. There’s no set plan to expand the WSU nursing program right now, but it’s something that leaders want to do, Hatch said. First, the program would need more space and money to hire faculty. WSU wants to soon offer an accelerated bachelor’s program for nursing, Hatch said. It will be open to people with a college degree in any field, and they can earn a nursing bachelor’s degree in one and a half years attending full-time. Another plan is to grow simulation laboratories at WSU, allowing for more hands-on experience. 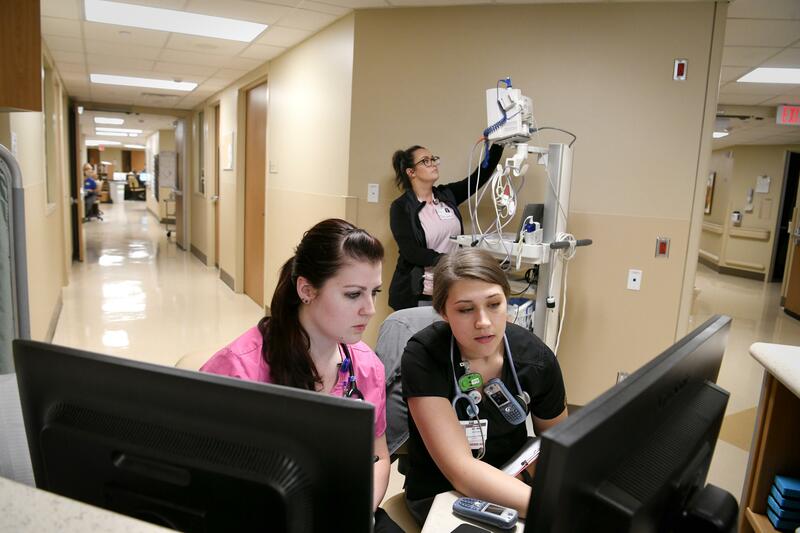 “Simulation can help student nurses learn how to care for patients who have complicated health care needs in a safe, supervised environment,” Hatch said. Schools are adapting their curricula for the aging population. In Spokane County, the number of people aged 65 and older has increased from 12.2 percent of the population in 2006 to 16.2 percent in 2017, according to the Washington State Office of Financial Management. Another tracker of population found an estimated 28,760 people in the county entered the category of age 65 and older from 2000 and to 2017, according to annual census population estimates. To prepare for the increase in baby-boomer retirees, Gonzaga is putting added emphasis on geriatrics. Three years ago, it started a new course to change the way it introduces students to elderly care because it can be traumatic for new students to treat patients with chronic diseases from old age. In the state of Washington, advertisements for nurses outnumber any other profession. More than 6,500 nursing positions were advertised in April, according to the Washington State Employment Security Department. Software developers had about 1,000 fewer. In Spokane County, the healthcare and social assistance industry employs more people than any other industry, according to the U.S. Census. So how then does a national nursing shortage show itself in Spokane’s hospitals? “We are just starting to see the cusp of a shortage,” said Heather Coleman, chief nurse executive at Deaconess. But she’s well aware of a national shortage. Coleman said they’ve been preparing for the shortage for more than 10 years, but the most recent recession delayed it because nurses needed to continue to earn money through the down times. But now that the economy has turned up, they are retiring, she said. Deaconess employs more than 600 nurses and the average age is about 48 years old, Coleman said. Coleman said it can take 3 to 6 months to fill a vacant nursing position. The bigger problem, Coleman said, is keeping nurses in Spokane after graduating. She said many of Deaconess’ nurses come from Idaho and Montana, but the nurses who went to school in Spokane tend to seek bigger cities like Seattle. Published: June 26, 2018, 6 a.m.